The surrounding area is a haven for fine restaurants and eateries. 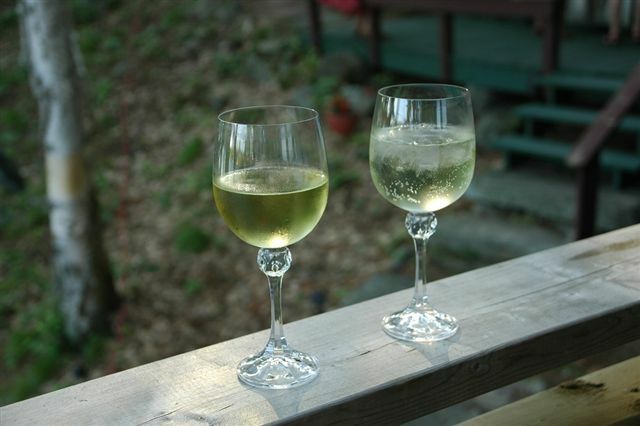 Excellent waterfront dining is only a 15 minute walk from our B&B. Or just a short 10 minute drive to enjoy a wide range of culinary fare. The Victoria Harbour Lumber Company homes were painted bright yellow, giving the town the nickname “Canary Towne.” The Company store, where the mill workers bought most of their goods, was also painted yellow. Great breakfasts, fabulous sandwiches and soups. Not to be missed home baking. A great place to gather with the locals and have a coffee and a piece of scrumptious pie. Come say hello to Brenda, Gary and their friendly staff. Don’t miss out on this one! A casual family restaurant and sports bar where the quality of the food vs the price is excellent. Karaoke – Friday nights. A very vibrant restaurant and bar with an excellent choice of food and beverages. The cuisine is excellent, as is the friendly and very upbeat service. Their 1/2 price chicken wings (which are totally delicious) on Thursdays, is always jam packed, but well worth the 10+ minute wait for a table. Open 7-days a week from 11:30 am – 10:00 pm. This is one of our favourite places for a casual meal. Renowned for their outstanding steaks, this family restaurant is a MUST on your where to dine list. The Arch has been open for over 30 years and the owners are some of the most personable people you will ever meet. An excellent all-around dining experience. An exquisite fine-dining restaurant boasting first-rate service and outstanding ambience – The restaurant overlooks a fabulous 27-hole Golf Course. Small, English style Pub with great ambience and attentive service. A good selection of imported and local draught beers. Awarded the much deserved distinction as One of the Canada`s Top 110 Restaurants. A fabulous and ecclectic selection of around the world cuisine. All meals are well prepared and very tasty. A very casual establishment with Outstanding service and ambience. A wine cellar boasting over 200 bottles of wine. Our most favourite restaurant. Renowned for its fresh Georgian Bay fish dinners. Large portions, casual dining in a friendly, relaxed atmosphere. An upper class, sophisticated restaurant boasting fresh seasonal menu selections, in a quiet, relaxed setting.One of the best wine selections in the area. Mom's old fashioned quality will remind you of a simpler time when family and friends would gather in the kitchen sharing good food and conversation. Attentive, caring service. Friendly family casual dining restaurant and a separate sports bar, including a large outdoor patio. More than 100 menu items including a unique selection of gourmet pizzas, mouth-watering pastas and a wide variety of appetizers, meal-sized salads, entrees and desserts. Restaurant Sainte-Marie offers visitors a marvelous selection of traditional Canadian cuisine, including casual and fine dining. Enjoy the comfort of air-conditioning or just relax on the terrace or under the pavilion. Great takeout place with picnic tables overlooking beautiful Penetang Harbour. This family run business has been an area landmark since 1967. For eat-in or take-out, the Dock Lunch is everyone’s favourite eating place. A waterfront fine dining experience in the scenic town of Port Severn. This is a great restaurant to have a nice meal, enjoy the fabulous ambience while watching a breathtaking sunset. Well worth the visit. Downtown Midland has a wonderful range of offerings from boutiques to bakeries to contemporary furniture stores and specialty tea rooms. Indulge in a handmade truffle, a steaming latte or delicious cinnamon sticky bun to while away your shopping day. Specialty shops for home and garden, clothing, fine art and afternoon tea are the perfect antidote for almost everything. Stretch your imagination with Midland’s galleries and antique stores. One-of-a-kind treasures are complemented by the friendliness and service of the shopkeepers and artisans themselves. Be it Museums and History, Natural or Recreational attractions you are looking for, Southern Georgian Bay has it all. Our area is one of the best kept secrets in Ontario – Rich with History, culture and breathtaking landscapes, we are indeed in the midst of Nature’s Paradise. There is something to do and see for everyone – You won’t be disappointed. The recreated Huron Village represents one of hundreds of similar villages that occupied Huronia for over two thousand years. These villages would have supported 30 to 300 families and consisted of palisades, longhouses, wigwams, sweat lodges, drying racks and fire pits. Huronia Museum houses a variety of displays, which illustrate the human history and culture of one of Ontario's most historic areas. Unique exhibits, which portray the many ideas, images and objects from the people of Huronia. Explore Canada's national treasure and Ontario's first European community. Experience the re-enactment & dramatic story of the 17th century French Jesuit mission to the Huron nation. Features an introductory audio-visual show, award winning interpretive museum, on-site restaurant and museum gift shop. Special summer presentations include 17th century fire starting, locked waterway demonstrations, and native storytelling with costumed guides. The twin-spired Shrine Church and 75 pleasantly landscaped acres honour the eight Jesuit saints who lived, worked and died here over 350 years ago. Learn about the Jesuit missionaries, Jean de Brébeuf, Gabriel Lalemant, and their companions who were responsible for bringing Christianity to Canada's First Nations peoples. A place of pilgrimage and a ministry of prayer. Features include Shrine Church, St. Ignatius Prayer Room, Papal Visit Monument, Little Flower Island, Irish Peace Garden, First Nations Park, picnic area and much more. The Shrine, church and facilities are wheelchair accessible. Discovery Harbour was once a military outpost. Now a historic site, many visitors to the Harbour have seen the ghosts of former soldiers walking along the grounds. It also the homeport to the historic replica ships H.M.S. Bee and H.M.S. Tecumseth. The on-location King’s Wharf Theatre offers great summer shows and diverse entertainment throughout the year. Fine dining can be enjoyed in Discovery Harbour's beautiful waterside restaurant Captain Roberts' Table, and impressive shoreline boardwalks provide the perfect place to watch an evening sunset overlooking Penetanguishene Bay. Last of the Clyde built Edwardian Steamships in the world. The Keewatin was built for the Canadian Pacific Railroad, in Govan Scotland. Delivered to the Great Lakes in 1907, this lovely steamer was destined to make history. For over 60 years she served as the “railroad” connecting the Georgian Bay and upper Lake Superior railheads. She is the last of the Great Lakes Passenger Steamships still afloat. Built by Fairfield Shipbuilding and Engineering Co., Ltd., Govan, Scotland. Sailed her maiden voyage from Greenock, September 14, 1907, arriving in Montreal, Canada, September 23, 1907. Separated in two sections for passage through the Welland Canal. Put back together at Buffalo, Lake Erie. Went into regular service between Owen Sound and Port Arthur/Fort William in Lake Superior on October 7, 1908. New depot facilities opened in 1912, shifting the Keewatin’s home to Port McNicoll, Ontario. Retired from service on November 29, 1965. Left for Saugatuck-Douglas June 23, 1967 having been purchased from the scrap merchant by RJ Peterson, to become a floating museum. Left Saugatuck-Douglas on June 03, 2012 to begin last voyage to Canada. Arrived home to Port McNicoll June 23, 2012. Overall length: 350 feet -Beam: 43.8 feet -Depth: 26 feet -Draft: 16 feet -Gross tonnage: 3,856 tons -Top speed: 16 knots -Cruising speed: 14 knots -Passengers: 288 (berthed) -Officers and Crew: 86 Engines: quadruple expansion, with hand stoked coal-fired Scotch boilers, producing 3,300 horsepower. A history of one of Ontario's oldest communities, newly renovated. Visit the 1875 Lumber Office and the original General Store. Learn about the importance of the logging industry in the town’s beginnings. The 4500 sq ft addition houses a great hall with rotating art and traveling exhibitions, archives and Geneology and History Research Centre. Over 30 huge murals grace the walls of businesses in the downtown core. The mural painted by Fred Lenz stretches across the ADM grain elevator building at Midland's harbourfront and is 80 feet by 270 feet in size. This project has been labeled the "Largest Outdoor Historical Mural in North America. The entire walk will take you about an hour and you won’t be disappointed. Stephen Leacock, Canada's beloved humourist spent his most creative time in what he coined as Lake Simcoe Country. In 1910 Stephen published the first of his humorous books, Literary Lapses and thus began a humour-writing career that gained him fame throughout the world. From 1910 until his death in 1944, Leacock produced an impressive string of best selling humour books which still sell remarkably well over sixty years after his death. You are indeed in the midst of nature's paradise. The many picturesque and breathtaking tours, the abundance of magnificent, scenic parks full of wildlife and natural wonders for you to explore, and world renowned beaches are but a few of the many attractions that draw a multitude of vistors to our region every year. A non-profit environmental awareness facility that is home to some of the largest remaining breeding populations of rare bird species including Trumpeter Swans. One of the best places to observe the lifestyles of mink beaver, ermine, porcupine and river otter. Enjoy the fresh air as you canoe through the marsh or just take a leisurely walk in the woods. Offers various activities and special events throughout the year, guided hikes, exhibit hall, video theatre, snack bar, gift shop and lunchroom. Take a Sightseeing Cruise aboard the 300-passenger Miss Midland and experience the sparkling water, the windswept pines and rocky grandeur of Muskoka-Georgian Bay's 30,000 islands. Food, bar services and dinner packages available. We will gladly make reservations for you. Owned & operated by Midland Tours it replaced the Georgian Queen. Enjoy the fabulous vistas and crystal clear waters of Georgian Bay in this magnificent 265 passenger ship. This lovely ship is also available for private charters and rentals It will depart from the Penetanguishene Harbour. We will gladly make reservations for our guests. Awenda Provincial Park is a natural oasis and a perfect family get-away. Awenda is located near Penetanguishene, only a 30 minute drive from our B&B. With incredible wildlife, natural wonders and spectacular views of Georgian Bay, Awenda offers visitors a “natural room with a view.” Over 30 km of hiking trails, fabulous beaches and in the winter, cross-country skiing complete with warm-up huts. Let us pack you a lunch for a day of fun and excitement. At Georgian Bay Islands National Park you will discover spectacular landscapes, time-worn rock faces, diverse habitats and the rugged beauty of the Canadian Shield. These magnificent islands are only accessible by boat from Honey Harbour. Let us pack you a lunch for a day of discovery. A highlight of any visit to the waterway is watching the giant carriage at the Big Chute Marine Railway carry boats over the Big Chute on the Severn River. It works on an inclined plane to carry boats in a cradle (without a filled tank) over a change of height of about 18 metres. It is the only marine railway of its kind in North America still in use. Let us pack you a lunch for a day of adventure or dine at one of the many local fine restaurants and pubs. Balm Beach is only 30 minute drive from our B&B. Located on the east shore of Georgian Bay it is part of world’s longest freshwater beach. Spend a day in the sun, swim in the crystal clear waters or view spectacular sunsets overlooking Blue Mountain. Go-carts, mini-golf and even an old-fashioned family arcade await all visitors Let us pack you a lunch for a day of adventure or dine at one of the many fine local restaurants and pubs. There is plenty to do and see in Georgian Bay. There are many recreational activities like Canoeing, Hiking, Biking, Golfing and Bird Watching just to name a few. Experience the beauty and unique freshwater coastline of the 30,000 Islands in Georgian Bay. A prime sea kayaking and canoeing destination for paddlers from all over the world, where wonders never cease. Explore the splendour and rugged shoreline of the 30,000 islands. Marvel at the wildlife and the ever changing terrain and scenery and be one with Nature. - The area offeres access to several of Ontario's pre-eminent trail systems, connecting may of its parks, cultural and natural amenities, as well as numerous smaller trail systems. The intention is to capture the communities situated along the shoreline of Georgian Bay, and the significant natural features around them, particularly the Niagara Escarpment and the Beaver Valley. The horseback riding trails at Highview Farms are truly a Georgian Bay experience. A place to enjoy Nature at its best! Enjoy your trail ride with an experienced Trail Guide leading the way and horses suited to your riding ability. No experience is necessary to ride the trail systems. Take a six-hour Salmon or Trout fishing trip with Captain Bill George who has been providing exciting half-day outings since the mid-80's; and he knows where to find the fish. The Wye Marsh is host to numerous species of birds and is a bird watcher’s paradise. Don’t forget to take a camera and some sunflower seeds along or get the seeds at location; and be amazed how the Black-capped Chickadees will eat out of your outstretched hand or off your head. You will also have an opportunity to see some resident Trumpeter Swans and various species of birds that are being nurtured back to health. This is a great way to spend a day, as the marsh is truly magnificent. Our wedding sandolo buranello is hand carved and imported from Venice Italy. It is the only wedding sandolo buranello ever to have left Italy. They are very rare and only one operates in Venice today. Anniversaries - Birthdays - Bridal Showers - Prom - Proposals - Weddings Elopement - Honeymoon - 2nd Honeymoon - 3rd Date - I'm Sorry - Gift. Call your Romance specialist and leave your parents at home. Or, Cruise around Little Lake the canal and by the yachhts and kiss in the fading sunset. There are warm blankets on-board for you to snuggle up under on the cool nights and batten burg lace parasols to protect you from the mid-day sun. You can even bring your own refreshments. Midland and the surrounding area boasts some of the finest golf in Southern Ontario. There are three outstanding courses within a 20 minute drive from our B&B. Let us reserve a tee-off time for you . (on an available basis). Awenda offers 30 km of trails. These trails will help visitors to discover some of the park’s fascinating features. After 35 years of being involved in the skiing industry, Mount St. Louis Moonstone has gained the reputation of being Ontario's Best for Family Skiing/Boarding and World Famous for Mountain Building. Movies, live music and/or theater can be enjoyed most nights of the week in and around Midland. Huronia Players is a community theatre group based in Midland, Ontario. 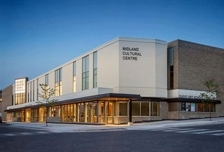 We provide education and workshops for theatre arts and produce three major productions each year at the intimate 120 seat theatre in the Midland Cultural Centre at the corner of King and Elizabeth Streets. We can try to reserve tickets for you, if you wish. Operated by the award winning Drayton Entertainment Group, a registered charitable organization and one of Canada's most successful professional theatre companies, presenting the finest in musicals, comedies, and dramas. Open June - Sept. - We can try to reserve tickets for you, if you wish. The Carriage House – The Gallery is situated in a late 1800’s home with an old Carriage House in-situ. The Carriage House established in 2007, by Carol Currie and Stuart Leggett, husband-wife collaborative artists who developed a medium they call sculpted paintings. As artists, their mandate is to awaken the community to the eyes and mind of the artist, a place where art and artists matter. This gallery is well worth the visit and should be on everyone’s itinerary. The stunning Georgian Bay landscape paintings and prints in our Georgian Bay room are just a small indication of the superb artistry of our resident and very popular artist Ms. Lu Robitaille. Her deep feelings for Georgian Bay live in the art she creates; her rocks and water reflect the love and warmth she has for this unique part of Canada. She has also developed a great affection for the character of old farms and lighthouses, but her passion is the Bay. While primarily known for her miniature paintings, Lu has developed a style and format based on water colour for her medium. She also paints larger pieces and commissions that now hang in homes and collections from Switzerland to California, England to the Bahamas. A veteran of dozens of juried exhibitions, private showings and public shows, Lu has won international awards and a place in the hearts of art aficionados everywhere. Membership in the Miniature Art Society of Florida Inc. has brought her increased international exposure and Lu's work is getting global recognition. Lu's work is in the collection of Her Excellency, former Governor General of Canada, Adrienne Clarkson. Ask us about either taking you on, or arranging you a tour of her studio. Gift Shop and Studio – 40+ Artisans. Providing an opportunity for artisans to showcase their work in a creative and natural environment on a consignment basis. We encourage handmade artistry with a focus on recycling, reusing and re-purposing. Open Thursday to Monday from 10:00am to 5:00pm – We are wheelchair accessible. Ottawa’s internationally-celebrated wine writer Natalie MacLean is an accredited sommelier, a member of the National Capital Sommelier Guild, the Wine Writers Circle and several French wine societies with complicated and impressive names. Her unswerving goal in life is to intimidate those crusty wine stewards at fine restaurants with her staggering knowledge. To fund her late-night vinous habits, Natalie MacLean holds down day jobs as a wine writer, speaker and judge. Natalie's book Red, White and Drunk All Over: A Wine-Soaked Journey from Grape to Glass chronicles her last three years sipping, spitting and slogging her way through the international wine world to visit some its most evocative places and to meet some of its most charismatic, obsessive and innovative characters. Rex Pickett, author of Sideways, says that Natalie “writes about wine with a sensuous obsession” and is “often laugh-out-loud funny.” Eric Asimov of the New York Times notes, “Ms. 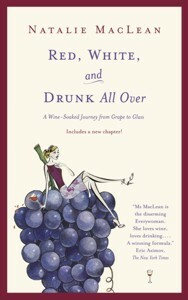 MacLean is the disarming Everywoman … she loves wine, loves drinking … a winning formula.” The Financial Times observes, “Natalie MacLean is a new force in the wine writing world—a feisty North American answer to Hugh Johnson and Janice Robinson. She can write beautifully about wine.” For more information on the book and to sign up for Natalie's vastly popular free e-newsletter, visit www.nataliemaclean.com. Red, White and Drunk All Over was recently chosen the Best Wine Literature Book in the English language at the Gourmand World Cookbook Awards. The book also won the Culinary Literary Book Award in the Cordon d’Or international culinary arts competition. At the World Food Media Awards in Australia, Natalie was named the World's Best Drink Writer. The competition received more than 1,000 entries. An international and independent panel of 47 food and wine experts selected her from a short-list of 14 nominees from the U.S., Canada, U.K., New Zealand and Australia. Natalie has also won four James Beard Foundation Journalism Awards for her writing about drinks, including the MFK Fisher Distinguished Writing Award, in memory of one of America's greatest food writers. This award was given out at the end of the ceremony for work of literary merit. She was also nominated for this award in 2005. Natalie has also won an unprecedented five Bert Greene Awards for excellence in food journalism, presented by the International Association of Culinary Professionals, four awards from the American Association of Food Journalists, four from the North American Travel Writers Association and three honorable mentions at the National Magazine Awards.